Are we really halfway done? I was in this luxurious head space where it felt like I would be here forever. Now, time seems to be flying by. 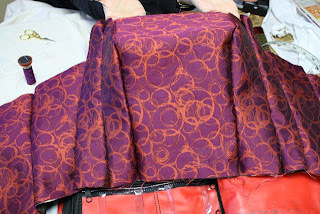 I spent today basting, un-basting, stitching, re-basting, and setting in some gorgeous sleeves. I got to see my coat all put together, and I love it. I also decided that the color of my fabric is "parakeet blue." Alas, I can't really show you much more of it since I want it to be a surprise in the book. But I can show you my classmates! Do you know Robin and Gigi? 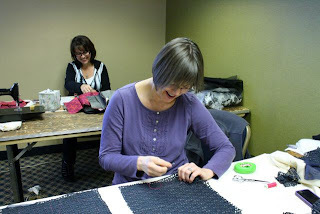 I hope so; they are fabulous seamstresses and bloggers, and just plain fun to be around. Isn't this shot of the two of them cute? You can just see what a good time they're having. 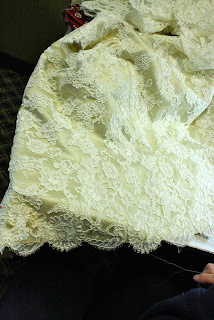 Robin's making a bolero out of this beautiful guipure lace, underlined with chiffon. Gigi is sewing a va-va-voom strapless dress that she swears will stand up on its own once she's put the boning in it. I believe her! We named Barb "Baster of the Year." Have you ever seen such lovely stitches? 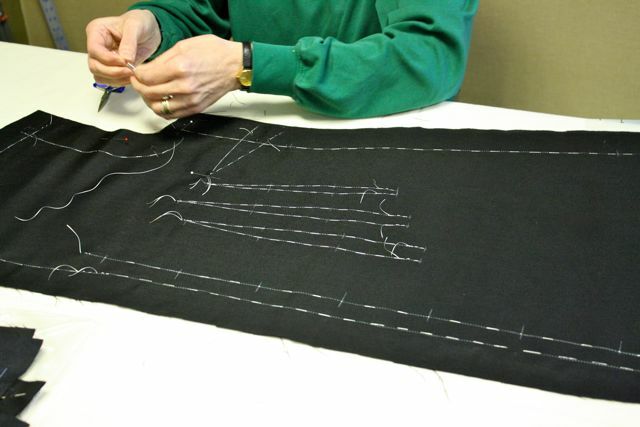 Jean is making an amazing lace jacket with a sand-colored charmeuse underlining. She seamed the lace by hand, and the stitching is completely undetectable. That's the news today from Camp Couture. More to come! All that wonderful creative energy you're absorbing. Pure bliss. Those basting stitches are absolutely beautiful they look like they were either drawn in or done by machine. Your coat is going to be gorgeous. I'm am glad that there are such wonderfully talented people out there. And this looks like so much fun. But OMG you guys are crazy with all the hand stitching! hand stitching can be soothing.....maybe that is what I need...yeah, hand stitching. (I think this all sounds wonderful, but how on earth do the other folks decide what project to bring with...I know how you piked yours. Can't wait to see it.) k.
Gertie, give my love to both Robin and Gigi (yes both very special ladies, sewists and bloggers) and of course last but not least Susan. Time flies when you are having fun. Can you read the jealousy in between these words? FABULOUS - I aspire to baste that that women. 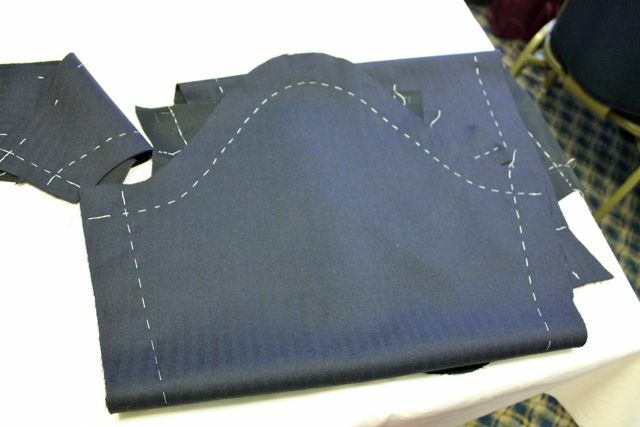 It is what creates the accuracy in the garment! I am sooooooo jealous. Looking at next years schedule to plan the experience for myself! Also - I know you are a little busy but have you seen this? I know you have but I just thought I would pass on because you would be great! Today is the last day to submit tho! It must be great to be in such a creative environment. I hope everyone's project goes well. Those basting stitches is so inspiring! Barb's basting is amazing. You should ask if she has any tips and how much experience she has with hand sewing. This is so cool! I took her online couture class on patternreview and just finished making my first wedding gown using her book. I am so jealous but I have a one year old so can't come to camp. Boo-hoo!